So, you’ve decided to join (or renew your plan with) one of the largest networks in the US. Cool… but where does one start? There are plans that can support multiple lines, some let you use your phone as a mobile hotspot while others don’t, some let you add a mobile Internet modem, while others don’t, and then there’s the whole carfuffle with price options, data limitations, and so on. 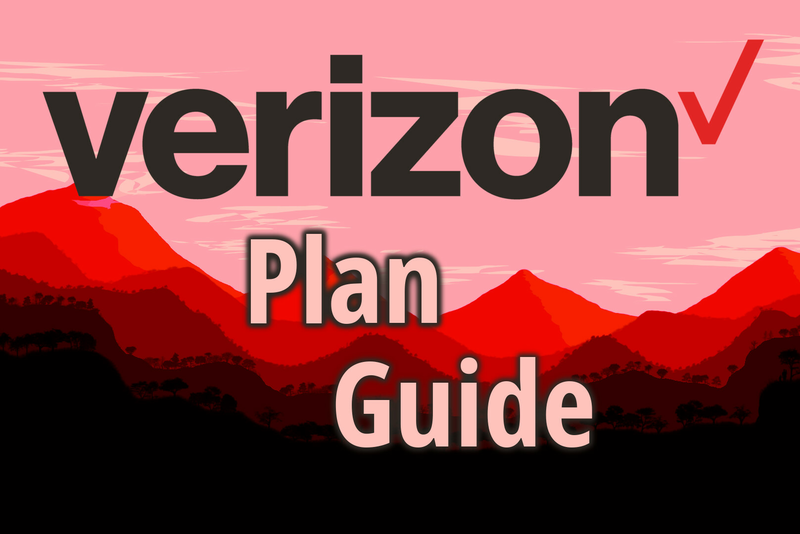 We studied the options that Verizon provides and came up with a buying guide, which would — hopefully — help you make better sense of all the offers and pick the right one for you. So, without further ado, let’s find the plan that’s good for you! Updated: Just Kids is a brand new offer for 2019. It can only be activated if you pair it with at least one Unlimited line. It's basically a cheaper Unlimited that can only call and text with 20 contacts. It has a 5 GB data cap, 480p video cap, and a subscription for the Verizon Smart Family app, which allows you to check location tags and set filters on the content your kids get to consume. OK, so you have everything in one package for a hefty price. As you can see in the table above, you get a better deal when you add more lines to that plan. A line means a device added, so if you get your whole family on that plan, you can get a lot of bang for your buck. The 22 GB is per line. Extra devices — of course, it would be rather silly if you had to pay a full line’s price if you wanted to add your smartwatch, tablet, USB modem, or mobile cookie to your Go Unlimited or Beyond Unlimited plans. These will instead cost you $20 monthly per device, regardless of how many smartphone lines you have on your plan. Mexico and Canada coverage — you can still use your unlimited talk, text, and some data when north or south of the border. There are a couple of caveats: data is limited to 512 MB per day before being throttled to 2G speeds (around 40 kbps). If for 2 months straight, more than half of your line usage is outside of the US, your service will be blocked. Above Unlimited gets two unique perks — 5 days of TravelPass per month, which gives you 512 MB of LTE speeds per day in 130+ countries worldwide. If you reach your cap for the day, you can still use Internet at 2G speeds. Extra TravelPass costs $10 per day. The second perk is 500 GB of free storage on the Verizon Cloud — always a cool thing to have. Limited speeds in congested areas — when you find yourself in an area with tons of Verizon users hogging the 4G network, your Go Unlimited data speeds may be limited as your phone’s requests will be put in a queue. Beyond Unlimited users will not suffer such throttling, no matter the traffic load, for the first 22 GB of data used per billing cycle and Above Unlimited customers will get a whole 75 GB of unthrottled LTE. If the lines on your plan reach that 22 GB / 75 GB limit, you will be treated as a regular Go Unlimited user and put in a queue when in congested areas. You can not get more Premium Data by purchasing a Data Boost, so don’t waste money. Video streaming resolution cap — Go Unlimited users will only be able to stream video in 480p on their smartphones and 720p on tablets when watching via the Verizon 4G LTE network. In our opinion, that’s not super-terrible, though some purists would frown at the resolution not making full use of their flagship devices’ super-sharp screens, so that’s up to you. Mobile Hotspot — both plans will allow you to use your phone or tablet as a mobile hotspot. But here’s the difference: Go Unlimited users will only be able to go up to 600 kbps on their hotspot, while Beyond Unlimited will let you use the full 4G speed (average around 36 Mbps) for the first 15 GB of mobile hotspot use. After those 15 GB are up, Beyond Unlimited users also get throttled to a 600 kbps speed. You can buy an extra 5 GB at top-speed for $35. Mobile wireless modems, USB modems, laptops — if you want to use an LTE wireless modem or add 4G connectivity to your laptop, you can only do so with the Beyond Unlimited plan. Our verdict: The video resolution cap shouldn't bother you too much, though the difference in tiny details is visible and perfectionists might be tempted to go for a Beyond plan. Heavily mobile users should really consider the Beyond Unlimited option. Having top speeds, especially when using your phone as a mobile hotspot to link your laptop, can be a lifesaver for the digital nomad. The Above Unlimited plan seems a bit overkill in pricing, however, its TravelPasses are a nice option for those who find themselves flying around a lot. 500 GB of cloud space is also a nice bonus for the digital nomad. We’ve got three tiers of data to pick from, but these are for account access only. As soon as you add a phone line to that account, you need to pay an extra $20 per month. Adding a tablet, mobile hotspot cookie, smartwatch, or a USB modem will set you back another $10 to $20 per month. These plans also don’t allow you to use your phone as a mobile hotspot. If you want to unlock that feature, you have to spend an extra $20. If you are over your data limit and want to add an extra gigabyte, that’ll be $15. Any unused data does carry over in the next month, which is a slight consolidation. Our verdict: Basically, you get guaranteed 4G LTE speeds at any time, whereas Go Unlimited may throttle you in times of congestion. Still, we don't think the bang-for-buck is very fair. If you don’t want to bind yourself to a lengthy contract, you can always go prepaid. There are no credit checks to worry about, too, and you are always free to jump ship or skip a payment if you are not going to be needing your line for that particular month. There’s also the added benefit of being able to mix and match different prices and data limits per line. Pretty cool, right? But there are a few caveats — every tier here gets video streaming capped to 480p for phones and 720p for tablets. Also, you may experience slowdown in data speeds in congested areas. But, on the flip side, you get unlimited text to over 200 countries and unlimited talk to Mexico and Canada! Once you reach your data limit, you get capped at 128 kbps — not ideal but enough to respond to chats. You can buy an extra gig of top speed for $15. Your data will carry over to the next month if you prepay before your billing cycle is up or if you have auto pay enabled. Our verdict: Depending on how many lines you will be using, a prepaid Unlimited plan could cost around the same as a Go Unlimited one. Also, the limited prepaid options seem to be a better deal than the contract-bound limited plans. If you want to get a brand-new phone from Verizon, but would rather be on a prepaid plan — you still can. You need to pay for the device upfront and be aware that it will be locked to Verizon for the next 12 months, and locked to prepaid plans specifically for 6 months. If you skip a payment, the 6-month counter gets reset. If you want to open just one line for a feature phone, a tablet, or for a mobile modem with Verizon’s 4G LTE, you can do that, too. You’ve also got the option to go for shared data-only plans for multiple tablets, laptops, cookie modems, and wearables. We decided to mash up these two categories in one. So, owners of basic phones can go for a $30 Single Device plan with unlimited text & talk, which also has 500 MB of data at full speed, just in case. That should be enough to get your emails and chats, which feature phones actually can do. If you need to purchase more data, you'd need to shell out $10 per GB. The data-only plan is great if you have a bunch of devices that you need to be connected to 4G LTE and you don't want to tie yourself to Verizon's text & talk services for one reason or another. It comes in a huge assortment of packages, starting from $20 for 2 GB per month shared across your devices and ending at $710 for 100 GB per month. These prices are for line access only. Every device you add to your data-only plan will set you back an extra $10 monthly. I'm right there with you! I have two unlimited lines and hotspot with them. I average 100 gigs on mine and 70-80 gigs on my wife's, LOVING IT!!! Hi there! I'm a very cautious user of Verizon and have spent a LOT of time with their customer service in regards to plans. I'm wondering what sources were consulted in preparation for this article, because I noticed a few things. First being that the 22 GB threshold on the Beyond Unlimited plan is actually per line, not the entire account. The same is true for the 15GB of mobile hotspot- it's per line per month. Secondly, smart watches are either $5 per line or $10 per line (depending on whether you have a Samsung or Apple). In reference to the tiered plans, my parents are smartphone users, but on average use about 2.5 to 3 GB a month, so having an affordable option for them is really helpful as anything more than 4GB would be utterly wasted on them! Thanks for giving a breakdown on the plans, I'm sure not everyone has the time to be as thorough as I have tried to be! Thanks. We will double-check the threshold limit. The smartwatch prices fluctuate a lot depending on what device you pair them with, customer loyalty, and other tiny tidbits. Doesn't help that the Verizon official documentation isn't constantly up to date. These plans are garbage!! I use 80-100gb a month with t-mobile and haven't gotten throttled yet. And I travel for work and haven't met a city yet that doesn't have good t-mobile service. Depends on where you live, of course every carrier will make sure their phones work in cities. Thanks! I used "modem" as a synonym for a 4G cookie / hotspot, since it's sometimes hard to make the distinction between Mobile Hotspot as a feature on the phone and as a separate device. I'll look into changing the language a bit. Is this an article or just an outright advertisement? I am curious where you got this info from, phones being locked for 12 months if they are put on prepaid? is that something new? Also the 22gb data cap is per line and hardly ever enforced. smartwatch 10 not 20... Not trying to nitpick but I've been a verizon indirect agent for 8+ years and some of this info is surprising to me. You can absolutely use mobile hotspot on the tiered data plans (2,4,8GB) and it does NOT cost $20 extra. It just uses your pool of data. This information is not correct. Verizon is just too expensive. I switched to Total Wireless, which uses Verizon towers and get 22.5GB a month shared between 2 devices for $63 a month. That would cost $100 on Verizon Prepaid. I might switch to a t-mobile based carrier soon though. CDMA systems like Verizon are too limited in their phone choices.